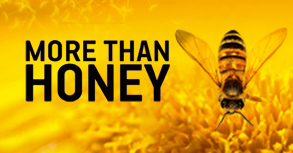 In ‘More than Honey’, Oscar-nominated director Markus Imhoof takes an in-depth look at honeybee colonies in California, Switzerland, China and Australia, from small family beekeepers to industrialized honey farms. The film is about the relationship between mankind and honeybees, about nature and about our future. Honeybees show us that stability is just as unhealthy as unlimited growth, that crises and disasters are triggering evolution, and that salvation sometimes comes from a completely unexpected direction. After the film, Friends of the Earth will say a few words about their Bee Cause campaign, and beekeepers from Ealing BKA and Ealing Transition Community Bee Project will be on hand for discussion over tea, coffee and cakes. The showing takes place at St Mary’s Church, St Mary’s Road, Ealing W5 5RH. Entry is free, but we will ask for a donation after the film to help us to cover screening costs. Do try to join us for this beautiful and important film. Previous PostDo The MathNext PostInspired into Action!